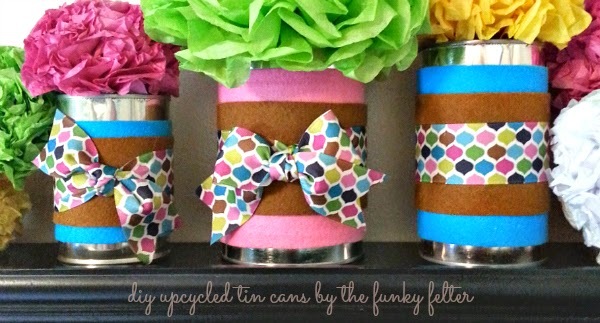 For this project, you'll obviously need some clean, dry tin cans. Make sure any sharp edges around the top are filed down or covered before you begin - please no 911 calls during this little craft project! Next collect some coordinating colors of felt and ribbon. I personally love all things bright - pinks, blues, greens - the sky's the limit on my color obsessions. However, as you can see, it is always good to mix in a neutral or two like the rusty brown to break up wild color combos. Measure the distance around the perimeter of your can and add about an inch to that for overlap. Then cut some 3 to 5 inch wide colored strips the measured length of felt for the base covering. The width really depends on your can height. I tried to leave anywhere from 1/2 to 3/4 inch of space of raw tin can at the top and bottom of my can as I like it showing, but you can cover it completely or show even more can - totally up to your great taste. For the top layer felt strip (the neutral rustic brown), I cut a piece anywhere from 1 to 2 inches less wide than the base covering felt. Just eyeball it to your design taste being sure to let the colorful base show through a little on the top and bottom edges. Now use some dots of very hot glue to attach the layers of color and neutral felt to your can along the seam. Check here for some great tips on how to best glue felt. To top it off, tie a pretty ribbon around the center of it all. Mine was a 1-1/2 inch wide patterned gross-grain ribbon from the local Hobby Lobby store. I knotted one, tied one and just left one plain. I like a variety for visual interest. 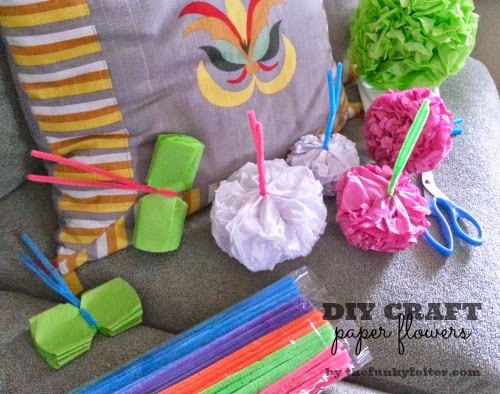 And, if you are admiring those tissue paper flowers, you can find the DIY craft tutorial for those here. They are a quick and easy way to dress up your house or a party. They're also fun to make. You can also make a similar upcycled can for craft storage shown here covered in fabric scraps instead of felt. I use these (which are even quicker to make) in my craft room to hold all sorts of things.